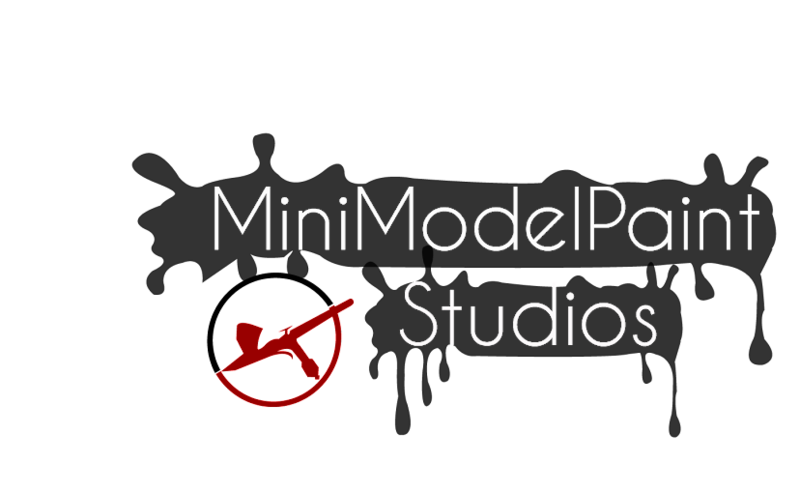 MiniModelPaint Studios: White Dwarf 2014. Need I say any more? 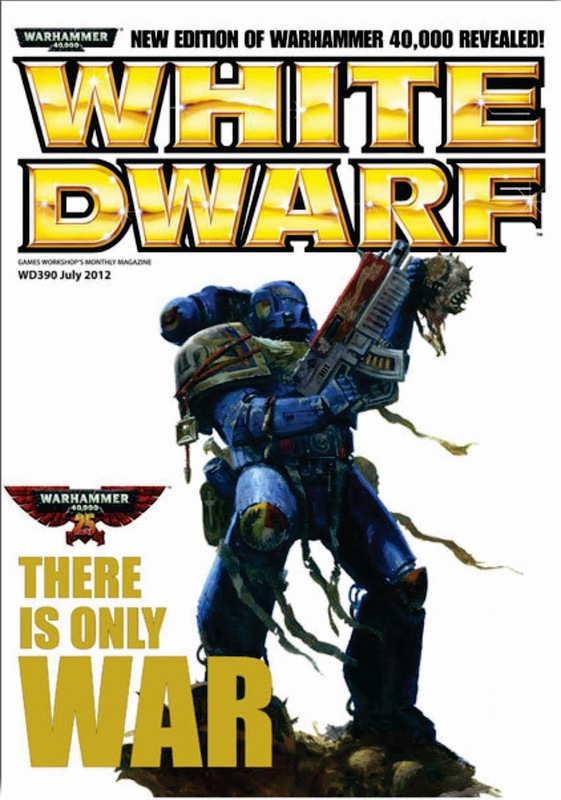 Maybe I should say more about the rebrand of Games Workshop's monthly publication. I have internet space, and I will use it... let's go back to 1977. 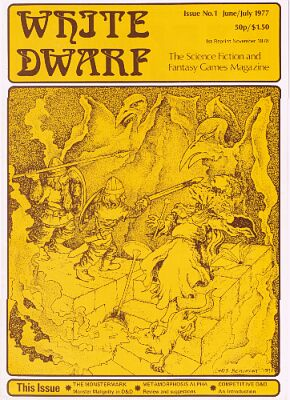 Many older readers harken back to the glory days of Jackson and Livingstone's White Dwarf: a hobby mag that ran interviews, reviewed other companies' products and had external advertising to help pay for it. It wasn't glossy. It wasn't corporate. There are those of us that remember nice features like Chapter Approved and occasional cover-mount freebies (even figures! ), and when the now-glossy mag gave hobby tips about building scenery from household objects, rather than trying to sell the latest boxset of trees and hills. The magazine has been heavily criticised for its overtly-corporate evolution. No longer are 3rd-party products advertised or reviewed, and the interviews are now only with GW staffers - from shop floor managers to Citadel heavyweights, like Jervis Johnson and John Blanche. There are battle reports and hobby tips, as well as previews of products and WIPs, but these all have a baseline sales angle to them, and, certainly for me, the painting tutorials are a bit dumbed-down. Fair enough - it's important to cater for younger painters (and older newbies), but without masterclasses and advanced tips, the magazine seeks to exclude veterans and young talent. The 2012 rebrand felt nice - even glossier than before, and with more clear-cut sections for in-house advertising vs actual editorial content. Gate-fold pages and a new photographic house style, as well as the super-gloss overprint on the covers made for a premium-feel product to match the company's aspirational claim that they make 'the best toys soldiers in the world'. I spoke with Senior Staff Writer, Adam Troke, at Games Day last September, and we discussed the imbalance between the three gaming systems from month-to-month. He agreed to an extent, but tried to justify the flaws in the publication, suggesting that they had to cater for the younger audience first. I sensed that he'd take the magazine in a more rounded direction if the jack-boot restrictions were lifted. I continued my subscription despite the price hikes. The photos were better; the articles were more interesting, and the mag felt like it was heading out of the corporate mire. And then came February 2014's issue. 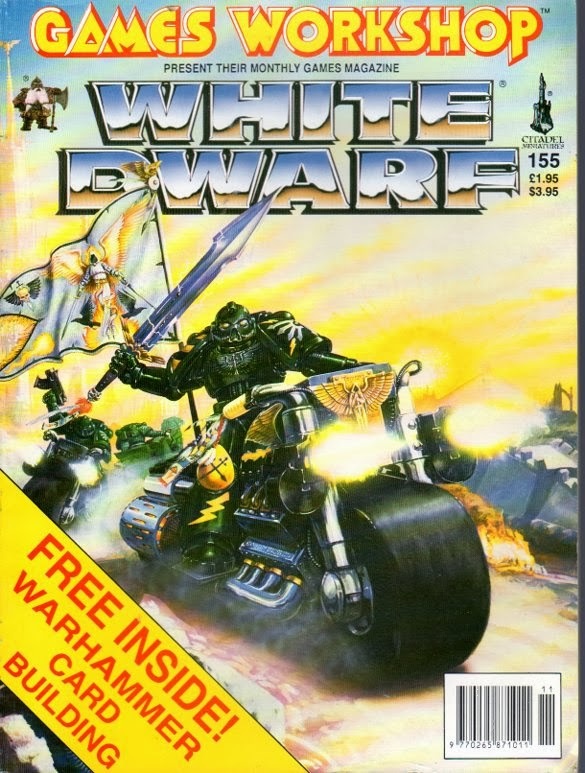 The first 1/3 of White Dwarf is themed advertising - the new release products, some apps and Black Library releases, and even a couple of pages dedicated to :Visions. 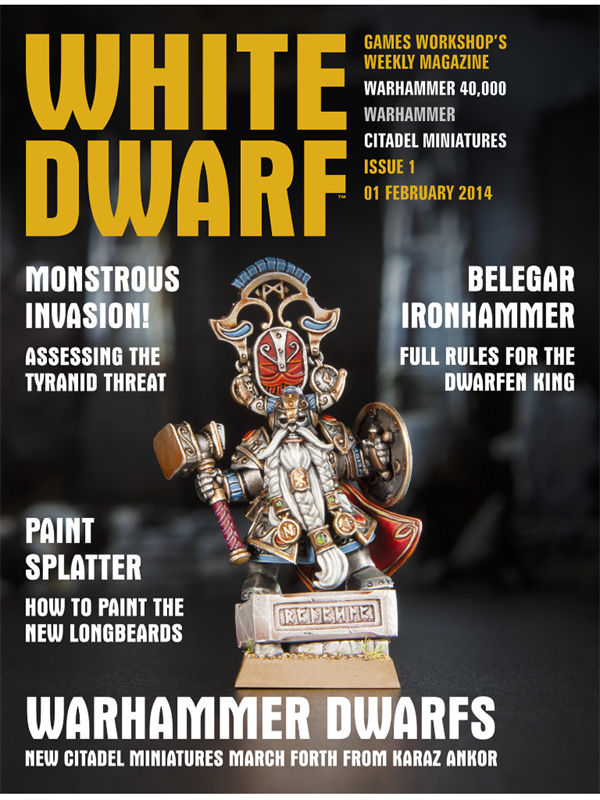 Jervis's column is included, as is a beginners' guide to painting the new dwarves. Sprues and Glue shows those same beginners how to use GW plastic glue to stick their models together. 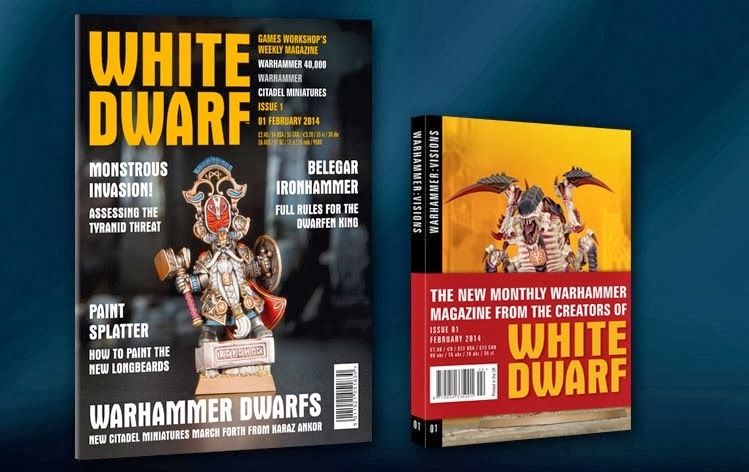 The back end of the mag is more readable, though - the usual Designers' Notes section is there, as is The Week in White Dwarf, which has been beefed up with a psuedo-Q&A, some margin fluff about alcohol, and some new Model-, Bit- and Weapon of the Week vignettes. Considering this mag in now a tenner each month, you'd think it would have some in-store vouchers or other incentive to hook you in. 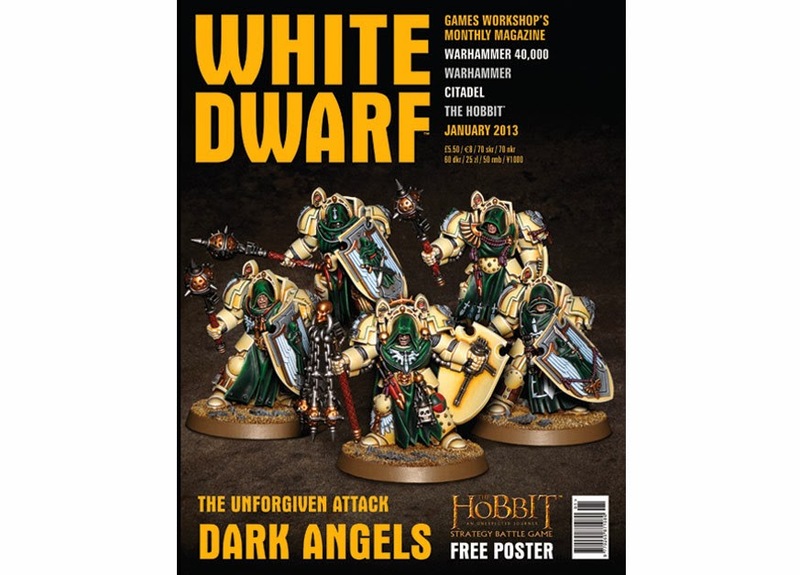 The new monthly Warhammer: Visions comes in at £7.49. You get a thick Reader's Digest-sized picture booklet, filled with above-average printed photography with caption translations in English, French and German. John Blanche's Blanchitsu makes little contextual sense, as it's just captioned photos. The Kit Bash section is improved in quantity, but would benefit from more technique/method, rather than finished steps. The best use of the magazine is the Parade Ground, which is substantial. Shame that the photos are a little grainy, but there are lots of Games Day model pictures. This surely works better as a digital product? I called the subscription line Saturday afternoon and cancelled my account. I may buy the occasional issue of White Dwarf, if the relevant hobby article comes up, but I really don't need an expensive, trilingual picture book. Goodbye, White Dwarf, you've taken up enough shelf space. I'll get my hobby info online from now on.